The building that houses the State Board of Equalization is located in downtown Sacramento at 5th and N Streets, just five short blocks from the West entrance to the State Capitol. But if you don’t have business there, I wouldn’t recommend dropping by for a visit. While many state government structures in Sacramento range from visually striking to blandly serviceable, the BOE’s headquarters are truly in a class of its own. Even though more than 2,000 people currently work there, the building has been described as “smelly”, “messy” and “plagued by bursting windows and mold” – and that’s just the accounts on the BOE’s own website. I am sure as well that readers of the FlashReport are not surprised to learn that this is the condition of the building after the state has spent millions of dollars in repairs, remodels and removal of hazardous substances. While this ramshackle structure literally comes crumblin’ down, can you think of a more suitable symbol for the condition of the BOE itself? It doesn’t have to be this way. I’m running to make sure of that. I’m running for election to the BOE because there is no other path for California to take than to shift the balance of government in favor of a free people, and further from the powerful grip of the public bureaucracy. There is no greater priority than to see our laws applied fairly to reward hard work and encourage growth through investment. And there are few greater honors than helping the taxpayer – residents of California — stand up to the tax collector. I don’t take this election lightly. It won’t be easy; and it shouldn’t be. But I can’t wait to take my core principles to the millions of voters I hope to represent: Government is too big, taxes are too high, and on a daily basis, the rights of the people are not respected by the public officials elected to represent them and the bureaucracy created to serve them. The effects of this troublesome trio are all around California. And pretending otherwise is as destructive as it is delusional. Simply put, Sacramento’s centralized system has failed. This is seen in our state’s perpetual budget crisis, our punitive pages of tax codes and, to be sure, even in the decrepit, dilapidated building that is supposed to accommodate every taxpayer’s right to be heard. For me, these are far more than slogans. These beliefs represent the story of my life. My family and I are Americans by choice, not by birth, and to this day, that is the best decision the Tran family ever made. Leaving Vietnam as it descended into unimaginable tyranny and then Communist oppression when I was 10 was a bewildering experience, but it instilled in me a love of liberty, an appreciation of individual rights and the realization that freedom isn’t free. One does not have to undergo the experience of your native country descending into a Marxist nightmare to appreciate the beauty of what Ronald Reagan called “The American Experiment” – but it can inspire a special admiration for the right of individuals to petition their government and to be treated fairly. We may think of these things as our birthright as Americans, and indeed they are. But it is also true that the right to be heard before your government, to be treated fairly, to challenge its rulings against you and successfully prevail in the end is something unimaginable to nearly everyone in the world. During my six years in the State Assembly I never missed an opportunity to urge my colleagues on both sides of the aisle to do two things: cherish the privilege of public service, and never forget who sent them to Sacramento. That’s the very first change I’ll bring to the State Board of Equalization – right after I make sure the building itself is still there. 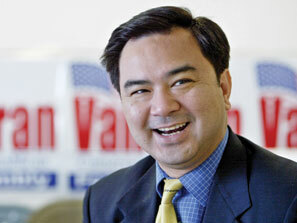 Van Tran is a former California State Assemblyman, representing Central Orange County from 2004-2010. Tran is currently a Republican candidate for the California Board of Equalization, 4th District. This entry was posted on Thursday, September 26th, 2013 at 6:40 am and is filed under Blog Posts.